One of the fastest ways to promote your website, product, service is to use social sharing websites. And Social Bookmarking is one of the best methods to build back-links to your site. You can increase your Search Engine rankings naturally with social bookmarking submissions. You will get more benefits to your website with bookmarking. Note: We accept all type ofURL (blogs, websites, YouTube, social media pages, photos, any types of URL) just that needs to be live on the webs. 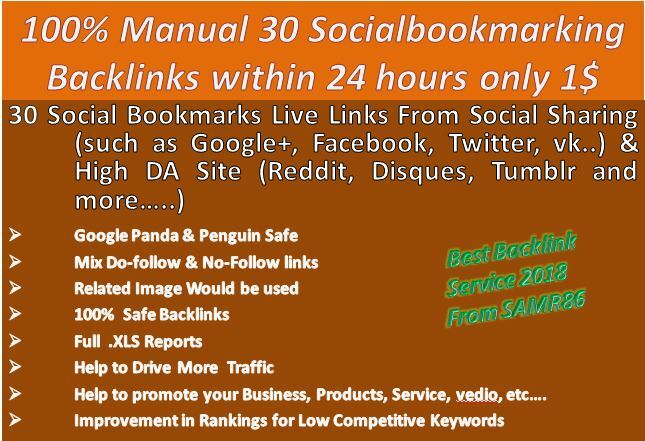 Instant 30 live Social Bookmarking links For Your Website or page or video within 24 hours is ranked 5 out of 5. Based on 55 user reviews.